Holste's Blog: Can A DC Have High Picking Rates With Low Picking Productivity? 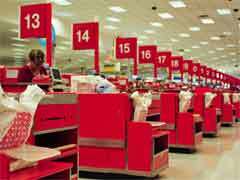 Is Now the Time to Finally Leverage Retail POS Data? What percent if the US LTLT market do the top 5 carriers control? Who Really has a Supply Chain Strategy? You would think, here in 2015, some 30 years into the "supply chain era" that to me started in the mid-1980s, that supply chain strategy would not remain so little understood and with not much in the way of accepted structure or formal adoption. I will briefly mention an incident a few years ago, where a supply chain director for a fast growing retail chain approached me at some conference. In essence, he said that for the past 10 years or so, all his company's supply chain could focus on was try to keep up with the growth in terms of overall sales and new store counts, and that as a result there wasn't a lot of time to worry too much about an overarching strategy. "I will note here that Paul Dittmann of the University of Tennessee found in 2013 that just 18% of the members of his Supply Chain Forum had a formal supply chain strategy, so perhaps the JDA group actually overstates the reality a bit." But company growth was slowing, and there was a sense of "what do we do now?" beginning to take hold. What we need is a supply chain strategy, he said - but they were very unsure what one really looked like. I think this is not unusual even today. So I am going to devote two or three columns to supply chain strategy over the next couple of months and hopefully shed some light on this important topic. In early May, I attended the Spring meeting of JDA Software's Demand Optimization Council (DOC), a group of some of its leading retail, manufacturing and wholesale customers who share insight and activities in the supply chain. It's a good group, managed by David Johnston, and I have been attending as sort of a guest contributor for the past five years or so. Each meeting has a theme, and this year was a very basic one: what was each member company's top supply chain initiatives for the year? Good topic, but it seemed to me that supply chain initiatives sure ought to be connected to supply chain strategy, right? One would hope so. I worked with Johnston to construct a brief survey around strategy and initiatives for DOC members to respond to prior to the meeting. While we only had a little over 20 respondents from this small group, I am confident the results are not that much different than if we had received 100 surveys. The results from that effort provide a nice intro to the subject of strategy. 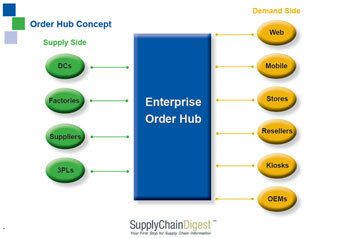 So I started with the basics: do you have a formal supply chain strategy? As shown below, it was a mixed bag, with 36% saying Yes, another 36% saying No, and (as I suspected) 27% saying "Sort Of." One of the Yes votes was in fact a retailer that said it was creating a formal supply chain strategy for the very first time. I think that sounds about right: roughly a third each in the Yes, No, Sort Of categories. 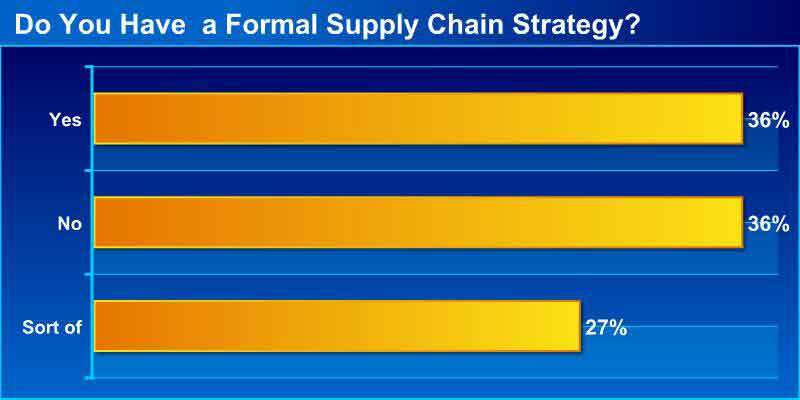 I will note here that Paul Dittmann of the University of Tennessee found in 2013 that just 18% of the members of his Supply Chain Forum had a formal supply chain strategy, so perhaps the JDA group actually overstates the reality a bit. I hope we can agree that this state of affairs is generally not good. What companies I assume must have instead of a formal strategy are perhaps yearly tactical plans or maybe even some what you would say are strategic initiatives, but what are those really connected to, and are they actually what the company needs to move forward successfully or optimally? In terms of refreshing those strategies, about 36% of DOC respondents said they update their plans annually, versus the 36% that had no strategies to update, and probably the same 27% in the "Sort Of" state that said their strategies are updated "as needed." 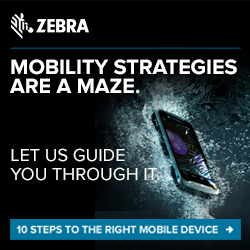 What is your company's approach to strategy refreshes? As I assume is obvious, a key role of a supply chain strategy is to bring that plan into close alignment with the company's overall strategies and objectives. And here the results were pretty good. 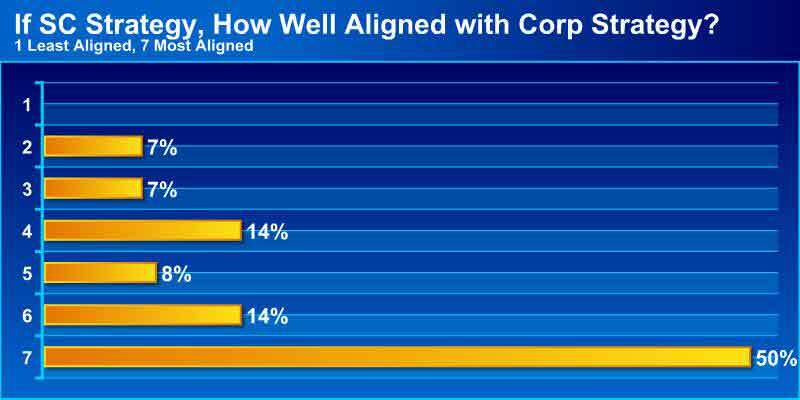 Of those companies that answered either Yes or Sort Of to the do you have a strategy question, fully half said their strategies were a 7 out of 7 in terms of aligning with corporate strategies. The other half had varying levels of alignment, as shown below. If this result is accurate, it certainly represents a lot of progress over the past decade. Changing direction a bit, I also asked respondents whether they saw the major opportunity for improving their supply chains from internally-focused efforts, efforts related to better integration/execution with external trading partner, or both. 64% said the greatest opportunities were internal, versus 36% who said it was a mix of internal and external. No one said the best opportunities were externally focused, which is interesting. 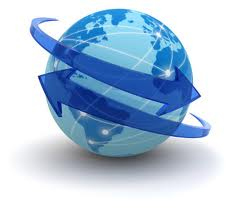 Says we are hardly near the end of internal supply chain progress. Now, part of "alignment," it seems to me, is how supportive a company's CEO is for supply chain initiatives. Here, the results weren't quite as strong, with only 18% scoring that a 7 on a 1 to 7 scale. 55% scored their CEOs as a 5 on this scale, and smattering of others just 3s and 4s. 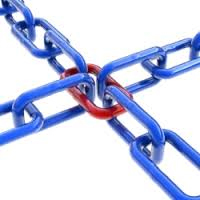 That results reminds me of the Harvard Business Review piece Dittmann, Reuben Slone (now head of supply chain at Walgreen's), and the late Tom Mentzer from the University of Tennessee wrote for CEOs called "Are You the Weakest Link in Your Company's Supply Chain?" Finally, I asked the DOC members where a series of investment activities rated on the priority list, again on a 1 to 7 scale, the results of which are shown below. General "supply chain execution" topped the list, with an average score of 4.9, I suspect a result driven by the need for Omnichannel investments by retailers and consumer goods companies. But that was followed closely by general supply chain planning and "what if" planning/scenario analysis initiatives, the latter driven I guess from the ever increasing focus on supply chain risk mitigation. As the chart notes, a few categories, such as big data and mobility, had what I called "high polarity," meaning some companies saw these areas as very high priorities, others as very low, with few in the middle, even if the average score was in-between. There was more, but I am out of room. More interesting than all of that was an exercise in which I asked everyone in the room to write down his or her definition of what a supply chain strategy is. The results were all over the map, to say the least, which sort of illustrates my early points here. More on that - including thoughts on strategy from some industry experts and eventually my definition o - in coming weeks. Any reaction to these data points? Do most companies have a formal supply chain strategy? Should they? Let us know your thoughts at the Feedback button or section below. Q: What percent if the US LTLT market do the top 5 carriers control? A: FedEx Freight, UPS Freight, YRC, Conway Freight and Old Dominion control 54% of the market by revenue.